This is just a quick, spontaneous post, because I'm very happy I rediscovered this natural hair care brand. 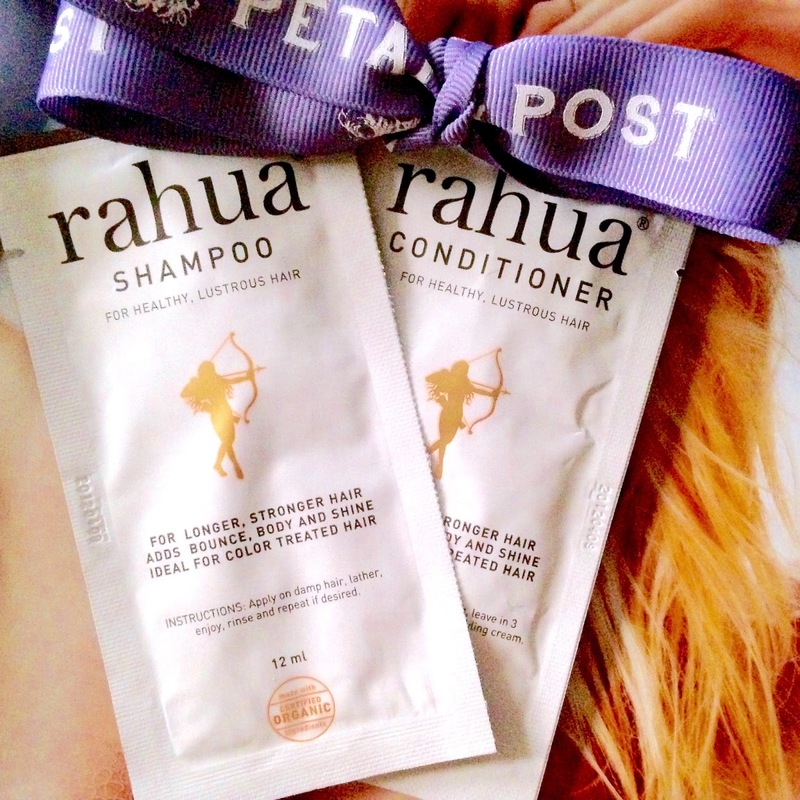 I was running low of my usual shampoo and conditioner this morning, so I finally got around to opening these Rahua Shampoo and Conditioner samples I received from Petal & Post (I guess I was saving them for a rainy day; today actually is a rainy day, which explains the poor photo quality). 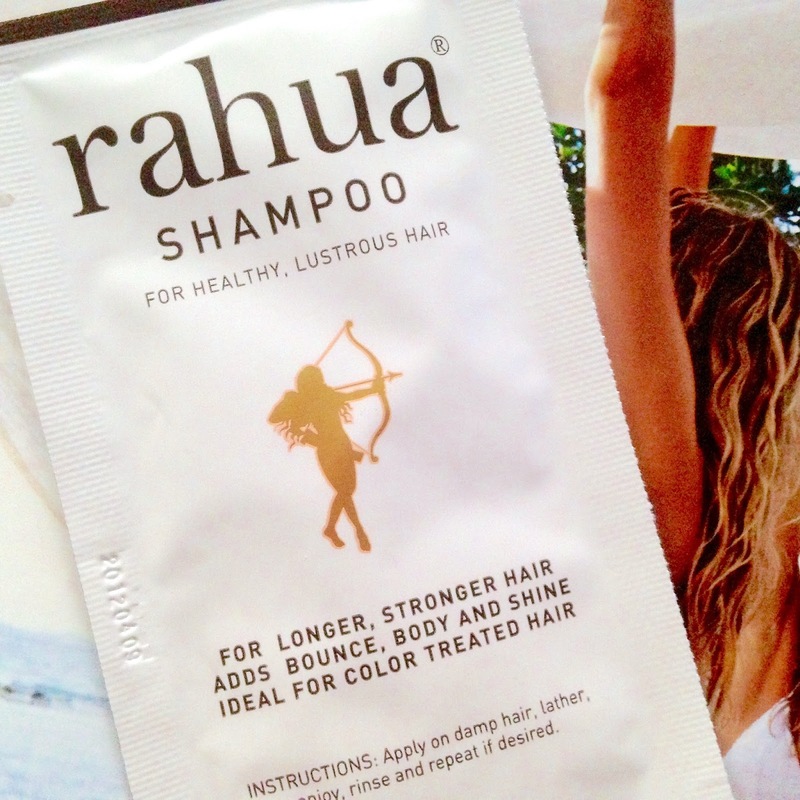 It's been a while since the last time I washed and conditioned my locks with Rahua, but my love for it returned the minute this shampoo came in contact with my hair and scalp. This 100% natural, organic, gluten-free, cruelty-free, vegan shampoo gently cleanses my dry hair and oily scalp with a nice lather and lightly sweet scent (from clean ingredients, of course; you can find the full list of ingredients on the Petal & Post site). My head is left feeling clean and in balance thanks to Rahua's pH of 4.5-5.5, which is the same range found in healthy hair and skin. 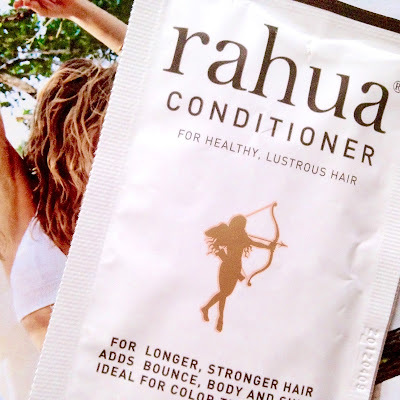 All of Rahua's hair care has a pH in this range, including this conditioner, which looks and smells amazing, like a rich tropical butter. It's star ingredients include Rahua oil (it fortifies weak, damaged strands, while nourishing the scalp), Palo Santo (Rahua's signature scent), quinoa (this gluten-free superfood vitalizes hair and promotes healing and moisture retention) and aloe (also a wonderful moisturizer). Although luxurious, this conditioner does not weigh my thin hair down, while providing the exact amount of conditioning it needs. My hair is left soft, shiny and tangle-free (it also smells intoxicating). As I mentioned at the beginning of this post, you can find Rahua hair care products at Petal & Post, which only sells products that are free from sodium laurel sulfate, sulfates, parabens, propylene or butylene glycols, petroleum, PEGS, TEA, DEA, phthalates, GMO, silicones, pesticides, BPA, lead, artificial dyes, harmful synthetic fragrances or animal by-products. In other words, you can be assured that brands purchased from this site are safe to use. U.S. and Canadian customers can get free shipping with the code: rawdorable-SUMMER (the code is good for one use through 9/30/16). Have you used Rahua hair care products? What are your thoughts? Let me know on Twitter at @Rawdorable and/or Instagram (also @Rawdorable). * I received these Rahua samples from Petal & Post.